Yesterday, we began a short series considering some verses from the ‘Christmas’ story that challenge the traditional theological narrative of Christendom. As I implied yesterday, these verses should pique our interest in a search for truth. I don’t know about you, but I don’t care what men say, I want to see what Scripture says…. When someone talks about the Millennial Kingdom or the future eternal Kingdom, what comes to mind? Whose Kingdom is it? Who rules over it? Who was it promised to? Who actually gets it? Etc…. At the end of the Book of Revelation, what does the Kingdom look like and who is in it? Scripture gives a very unified story that often does not match the narrative I was taught growing up. At least, the focus I heard in church was quite different than what Scripture says. A beloved part of the ‘Christmas’ story is the angel’s visit to Mary. Here is part of the encounter and a difficult verse. [His] sanctuary is in their midst forever. If brother Christian is expecting Jesus in some ethereal heaven far away without the Torah, including the statutes and ordinances, then he is in for a rude awakening. Besides upholding the Torah to perform all righteousness, Yeshua, as King of Israel, has to always rule according to Torah! See Deuteronomy 17:18-20! Isaiah 2: 1-5 further confirms the Torah going forth from Zion in the last days. Myriad other verses point to Torah observance in the Millennial Kingdom… Zechariah 14:16-21; Isaiah 66:21-24; Ezekiel 40-48…. etc. This sequence we see here exactly fits the expectations of the prophets as recorded in Scripture for the Kingdom of David over which the Messiah rules. It is simply unavoidable that all who would be a part of this Kingdom will walk in the Torah, even the statutes and ordinances as we saw in yesterday’s post. The King will enforce the Torah! That is HIS Constitution for the nation. This helps explain in part why in Revelation the 144,000 are from the 12 tribes! It helps explain why the gates into the New Jerusalem are named after the 12 tribes! It helps explain why the New Jerusalem is situated in, well, Jerusalem! Folks, if you are celebrating the birth of the King, you may want to consider who/what He is King over, and what He expects of His citizens. Eph. 2:11 Therefore remember that formerly you, the Gentiles in the flesh, who are called “Uncircumcision” by the so-called “Circumcision,” which is performed in the flesh by human hands— 12 remember that you were at that time separate from Christ, [i]excluded from the commonwealth of Israel, and strangers to the covenants of promise, having no hope and without God in the world. 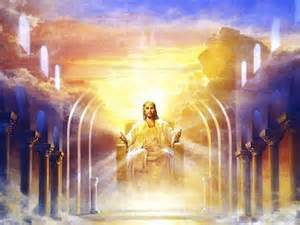 13 But now in Christ Jesus you who formerly were far off [j]have been brought near [k]by the blood of Christ. 14 For He Himself is our peace, who made both groups into one and broke down the [l]barrier of the dividing wall, 15 [m]by abolishing in His flesh the enmity, which is the Law of commandments contained in ordinances, so that in Himself He might [n]make the two into one new man, thus establishing peace, 16 and might reconcile them both in one body to God through the cross, [o]by it having put to death the enmity. 17 And He came and preached peace to you who were far away, and peace to those who were near; 18 for through Him we both have our access in one Spirit to the Father. 19 So then you are no longer strangers and aliens, but you are fellow citizens with the [p]saints, and are of God’s household, 20 having been built on the foundation of the apostles and prophets, Christ Jesus Himself being the corner stone, 21 in whom the whole building, being fitted together, is growing into a holy [q]temple in the Lord, 22 in whom you also are being built together into a dwelling of God in the Spirit. Notice who was far away, strangers and aliens that needed to be brought near… Not the Jews, but the Gentiles. Notice the name of the Kingdom: Israel! And, the King rules over it. If you celebrate the birth of the Messiah and fall under His headship, I recommend digging to understand what His house rules are… May you come to worship Him in spirit and TRUTH! This entry was posted in A Thought..., Holidays v. Feasts and tagged alien, Christmas story, citizen, constitution, dry bones, Ezekiel 37, idolatry, King Jesus, King of the Jews, pagan ritual, stranger, throne, tradition. Bookmark the permalink. This is your best series yet, and you have had some good ones. Thanks and keep them coming. Your writing is great … dare I say anointed? … but your “honey-do” list may bring more blessings to you and yours!!! Difficult verses in the ‘christmas’ story part 2. Study to show yourself a approved…..